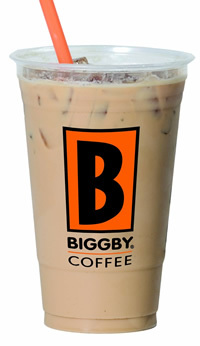 Biggby Iced Coffee made with Biggby's brewed coffee and comes in several sizes. Sugar content: 19.8 grams (per 16 ounces). How Does Biggby Iced Coffee Compare? Biggby Iced Coffee contains 12.00 mgs of caffeine per fluid ounce (40.58mg/100 ml).